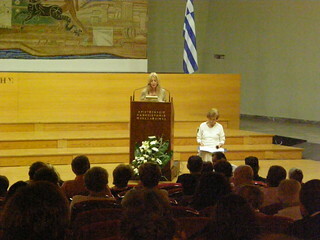 Vassula speaks at the Ceremonial Hall of the Aristotle University of Thessaloniki. 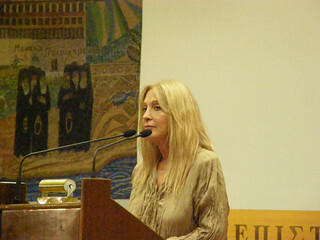 Vassula was invited to speak at the Ceremonial Hall of the Aristotle University, the main University of Thessaloniki and the largest in Greece and in the Balkans, on Friday October 7, 2011. Special importance was placed on this lecture, since Thessaloniki is Greece’s second major economic and political center, capital of the Periphery of Macedonia and a transportation hub for southeastern Europe. 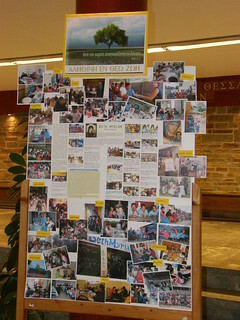 TLIG organizers and volunteers worked for about 3 weeks to prepare for the meeting. We e-mailed invitations, placed advertisements on websites and in newspapers and distributed flyers in the city center (mainly Tsimiski and Egnatia streets, Aristotelous square and the University Campus). 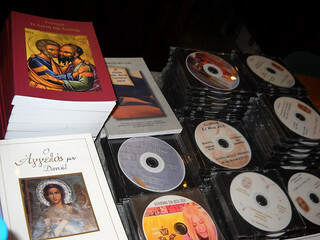 We also delivered informational material to the rectorate authorities and members of the Faculty of Theology, to the Holy Metropolis of Thessaloniki, the Roman Catholic Church, the Armenian Church, the Evangelical and Pentecostal Church and even the Jewish Synagogue, since everyone is invited to the Lord’s banquet. 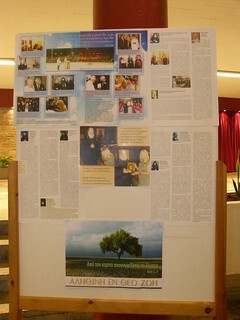 In order to spread the good news more effectively, we printed banners with Jesus’ face on them with details of the event, and had them placed several days beforehand at the University Campus and Aristotelous square. Unfortunately, the banners were taken down twice by some tattooed youngsters, who, like many in our days of apostasy, have lost their faith and would find anything that reminds them of their true foundations and faith irritating. Fortunately, we had already printed a total of 5 banners. Remarkably enough, the Aristotelous banner remained in place days after Vassula’s speech! Due to the irregular strikes in Greece, Vassula and her companion's flights were tremendously delayed. 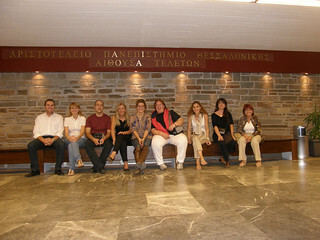 All flights leaving the island of Rhodes had delays of 6-12 hours because of an air traffic controllers’ strike. So, they had to wait 12 hours at the airport, and only at 02:00am did their flight depart for Thessaloniki, on the same day she was scheduled to witness. 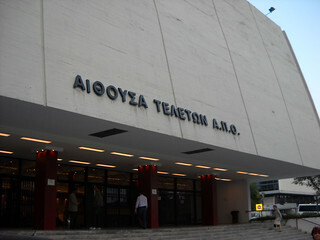 The organizers, knowing the fanatical reactions of previous meetings in Greece, made sure this time to hire a security company. In spite of all the security, there was an incident with a man who belongs to the so called Old Calendar Church; that is the conservative branch of orthodoxy renowned for its fanatics. However, he was taken out before he had the chance to create more confusion. The attendance was satisfactory, with about 200 people showing up, including several students. 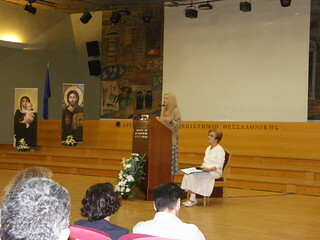 The subject of Vassula’s speech was about the Signs of the Times and about the prophesies given in the TLIG messages. She pointed out that when God manifests Himself it is so as to remind us of His Word and to call us to repentance. Vassula quoted examples from the Bible of how God reacts in times of rebellion and apostasy. She said that the whole world is decaying in its evil and in its apostasy, transgressing not only God’s Law, but all that is Holy. The world today has an attitude just like Pharaoh’s of rejecting in ones stubbornness and disbelief all that is Holy. Vassula then referred to the prophesies concerning the Twin Towers and the Sumatra tsunami in 2004. Ten years before the disaster at the twin towers, on 11 September 1991, our Lord warned us with this message. But instead of truly turning to God and repenting, the world became worse than before. She added that our Lord is very offended when we celebrate Christmas as a mere holiday of leisure without His Holy Name and without remembering Christ’s Birth. On January 7, 2008, at around 3:10 am, in another prophetic message, our Lady made Vassula understand that the catastrophic events are drawn upon us because of the world’s apostasy and especially because of the division of the Church. God is preparing the world for a chastisement with fire and all these events are closer than ever before. The earth will suffer with fire because of our incredulity and our reluctance to be led to true repentance; God is weary of our arrogance and our refusal to repent, and His mercy will not hold much longer. Our lady also said that we should prove our conversion by sacrifices and steady prayers, through which not only do we receive special graces from the Lord, but we also reduce the intensity of the Chastisement that is to come. Vassula also referred to the prayer our Lord gave her on November 28, 2009, which was a direct allusion to the eruption of the Icelandic volcano four months later. It seems that our prayers diminished the intensity of this phenomenon, however, worse will befall the Earth if people, who, like Pharaoh, continue to ignore the Signs of the Times. 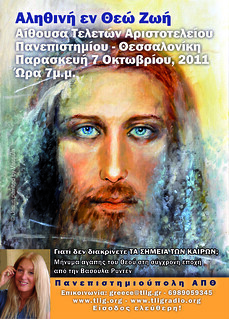 Vassula added that the “Day of the Lord” is at our doors, i.e. the day of warning, when everyone on earth will experience a revelation of their soul. God is warning us once again, and this constitutes an act of mercy on behalf of Him, so that we are once again given time to repent and confess our sins before the great chastisement. So far we have unfortunately paid no attention to His calls for reconciliation and unity, and His Words have been instead ridiculed and mocked.. Our only hope now is to diminish the intensity of this chastisement with prayers and acts of reparation. Vassula pointed out that the TLIG messages however, are not prophecies of oncoming disasters because in these messages God reveals His sweetness and His sublime love. These messages are meant to renew His creation; in our days the Holy Spirit is being poured on mankind as never before in history. She concluded that through the TLIG messages we are called to reach a divine state and to obtain the legacy of being the sons and daughters of the Most High. 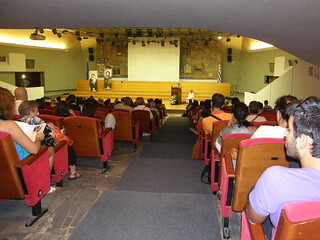 Vassula’s speech stirred a vivid interest in the audience and people asked questions that mainly concerned Greece. Vassula answered that God is satisfied with us because we have preserved the tradition. 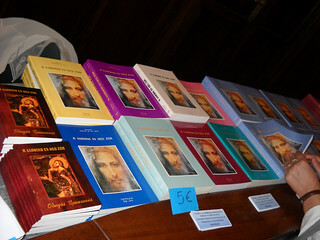 However, due to the apostatized spirit of the Greeks and because for years we've treated His Words with contempt and mockery, Greece will go through an intense purification, even worse than the current financial crisis. She also added that Jesus is all forgiveness. We have only to start opening our mouth to ask for His forgiveness, and He has already granted it before we finish our sentence. 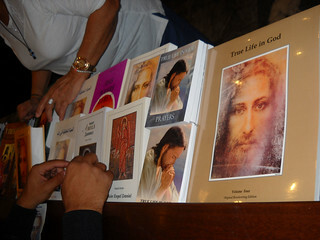 The next morning Vassula said that the Lord brought souls to Him. From here on, it is our responsibility to water the seeds; the people of Thessaloniki were more open than we had originally thought.